This morning a friend and I took our dogs out for a walk together. 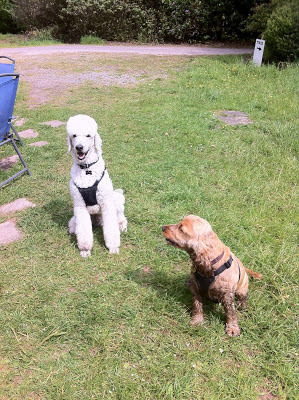 Boris and Ruby are great friends and walks together are good fun. 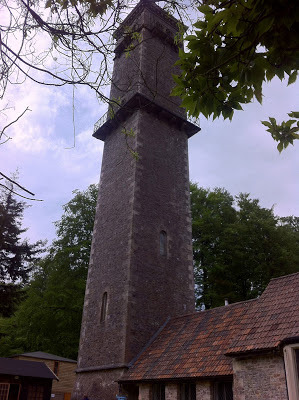 We went to Cranmore Tower a few miles away. The woods surrounding it were good walking territory and the dogs had a wonderful time running around. Sadly Ruby found a really wet, muddy puddle and got absolutely filthy. I had to get the hose out when we got home, poor thing. Luckily Boris was a little more sensible. Cranmore Tower is a Folly built in the 1860s by a local landowner who wanted to have a view of the land around him. The views from the top are spectacular and we'll definitely return on a less cloudy day to get a better view. We, and the dogs, walked up the 184 steps to the top and then down again. After that we felt that we really deserved a cup of tea and a piece of cake in the tea room. You can see how sensible Boris was, hardly a mark on him! But Ruby was filthy right up and including her undercarriage, and she even managed to get mud on her nose. Ah, but how is a dog to resist a good mud puddle? You have some very pretty places to walk. And the reward of a snack at the top is perfect motivation. Good for Ruby, she's living life to the fullest (and muddiest). Seems to me Ruby is a fun-loving creature of nature with a beautiful soul under that lovely (though mud-coated) fur. What fun!